Print your logo onto these custom printed executive leather folios with notebook a5 or one of our other innovative leather notebooks and use them in your next marketing campaign as a unique giveaway item. These Executive Leather Folios with Notebook bring a level of style and sophistication to any brand. They are the ultimate smart filo or office accessory. The leather cover comes with an elastic closure and branded with a blocked blind logo on the front (embossed). This is the type of stylish accessory that can be used for generations featuring its refillable wire bound pad and inner pocket with slit for business card/s (pencil not included). Bring class to your marketing campaign and stand out in style! Colours: Navy, Red, Black, Yellow, Blue, Brown. Other innovative corporate gift ideas that could be suitable to create brand awareness include these cheap promotional Portafino Leather Compendiums A5, quirky advertising gifts such as these Cameron A5 Portfolios or how about using one of our more bespoke custom made products such as these great quality 2-In-1 Compendium? Custom brand these bespoke custom natural leather items or one of our best-selling promotional notepads and notebooks»leather notebooks with your company logo! We can emboss your logo into the promotional executive leather folios with notebook a5. Embossing is similar to a stamping process. An extra cost may apply to get your executive leather folios with notebook a5 embossed. Personalise your executive leather folios with notebook a5 or custom design leather notebooks for your marketing campaign. How can these unique promotional executive leather folios with notebook a5 or our personalised leather notebooks fit in with your marketing strategy and help you maximise your brand exposure? Our custom made Executive Leather Folios With Notebook A5 can be produced from a minimum quantity of 100 pieces. 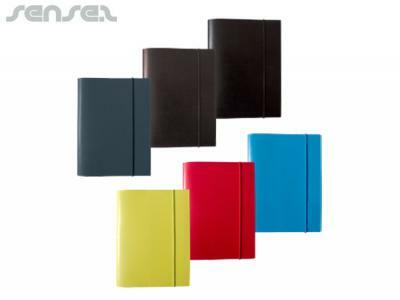 We can have your logo branded on these corporate Executive Leather Folios With Notebook A5 in Embossed. A setup fee of AU$230.00 will apply to make the film.